Over the past few years Ralph Lauren Watch Co. has made a significant shift in their marketing strategy. They are now sourcing many of their movements for new models, which were previously powered by mostly Richemont in-house caliber, outside of the Richemont group. Crucially, this allows them to lower their entry level price point. Last year, the RL 67 Chronometer 45 mm was introduced at a price point of $3,250, with a COSC Sellita SW-300 movement inside. And now, this year, they have introduced a 39 mm diameter version of the same watch, with the same movement, for $3,150. While this watch would obviously be more appealing with a Richemont caliber inside, it would also be at least double the price. The new 39 mm case is a perfect size for the average male wrist. 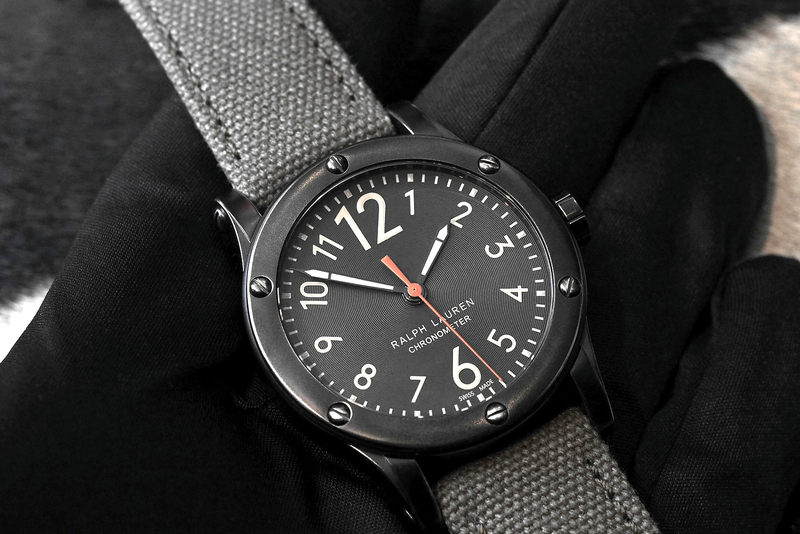 It still maintains a sporty look, but arguably, it is much more elegant than the 45 mm version. The case is a referred to as black “aged” steel, although it looks more like gunmetal. The sapphire crystal is slightly curved and features an internal colorless anti-glare treatment. Water-resistance is 100 meters thanks to a screwed down crown. The dial has an anthracite color and features an attractive circular guilloche patten. Large printed Arabic beige luminous painted numeral adorn the dial, and give it the look that seems to fit in to the style you would expect from the world of Ralph Lauren. The sword shaped hour and minute hands also feature a beige luminous paint. The baton shaped seconds hand has shiny orange varnish that contrast with the rest of the color scheme. A weathered olive green canvas strap, with black leather lining and pin buckle, rounds out the look. Overall, the small reduction in the diameter of the case, makes a huge difference in how the watch wears and looks. And while the movement inside is not an IWC, Jaeger-LeCoultre or Piaget caliber — like what came inside all new RL watches up until a few years ago — we’re guessing the typical Ralph Lauren customer likely won’t mind. They’ll be more interested in the aesthetics, brand name, and price, than what’s inside.